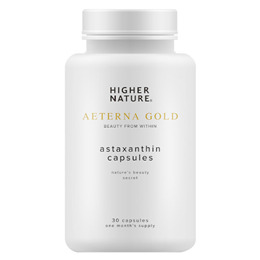 Aeterna Gold Astapure Timeless Beauty Astaxanthin is the ultimate skin protecting antioxidant. More powerful even than Vitamin E, it can help protect skin against harmful excess free radicals and UV light. In this way, it helps to delay the visible signs of premature ageing - for ‘timeless beauty’. Astaxanthin also enhances the antioxidant action of Vitamins C and E, which have been shown to help guard against age-accelerating free radicals too. Free radicals are unstable oxygen molecules, which can severely damage skin cells. They are created as a normal part of metabolism, but also by pollution, smoking, alcohol, stress, sunlight, medicines, heavy metals and poor diet. Ideal for children, teens and adults, when exposure to strong or prolonged sun is expected. Remember to pack a bottle on your winter-skiing and summer holidays. AstaPure® Timeless Beauty provides pure Astaxanthin extracted from an unpolluted source of the sea plant Haematococcus pluvialis. The optimal daily intake of just 4mg, as suggested by research, is easy to include into the beauty regime of even the busiest lifestyles. CONTAINS NO added: Sugar, salt, starch, wheat, gluten, maize/corn, yeast, lactose, dairy products, artificial preservatives, colours or flavourings. Below are reviews of Aeterna Gold Astapure Timeless Beauty - 30 x 4mg Capsules by bodykind customers. If you have tried this product we'd love to hear what you think so please leave a review. 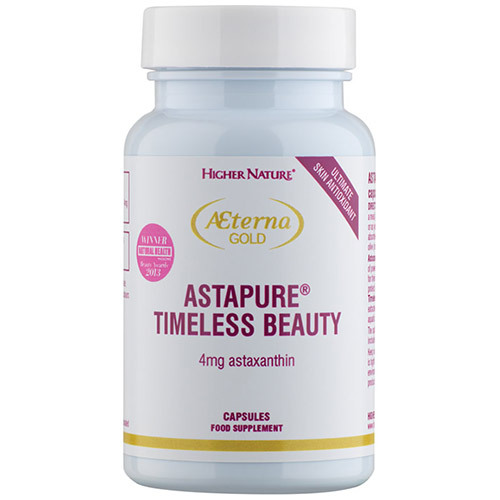 Aeterna Gold Astapure Timeless Beauty Astaxanthin is the ultimate skin protecting antioxidant. More powerful even than Vitamin E it can help protect skin against harmful excess free radicals and UV light.